Another great use for IoT devices is displaying things like traffic information, weather forecast, social media updates ... This requires us to send an HTTP GET request to the server of the service we'd like to access. Most popular services have API (Application Programming Interface) documents that explain that explain how you can retrieve certain information, and what format that information is in. In the following example, we'll look at Gmail specifically, but the code should be similar for other services. To communicate with Google's Gmail servers, we have to establish a secure connection to the server and send a secure HTTPS request with our email address and password. Gmail will then respond with an XML document containing all kinds of information, like (parts of) your most recent messages and the number of unread emails. To make sure we don't send our Google password to a malicious server, we have to check the server's identity, using the SHA-1 fingerprint of the SSL certificate. This is a unique sequence of hexadecimal characters that identifies the server. 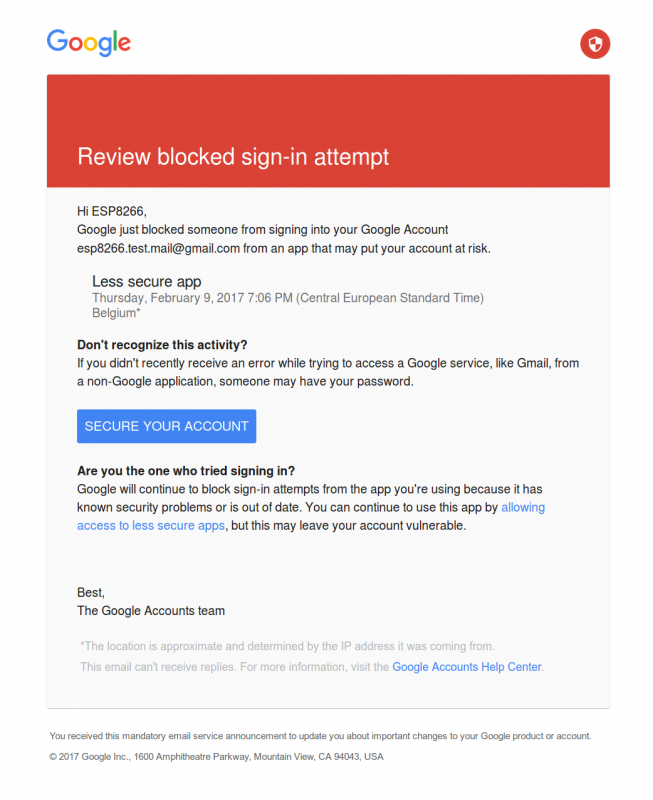 The only way (I know of) to get email information from Google on the ESP currently is the Google Atom Feed. This is an older method, so you have to change your Gmail settings to allow access to the feed. Until there's support for the new OAuth2 protocol on the ESP, we'll have to use the old, less secure method. Connect an LED (+ resistor) to pin 13, as an unread email indicator. The setup should be pretty familiar by now. First, it starts an HTTPS connection to the Gmail server on port 443. Then it checks if the fingerprint of the certificate matches, so it knows that it's the real Google server, and not some hacker. If the certificate doesn't match, it's not safe to send the credentials to the server. The request contains the URI we want to access (in this case this is the Atom feed URL), the host (which is mail.google.com), and the base64-encoded version of your login credentials. As you can see, the different lines of the header are separated by a CRLF (Carriage Return + Line Feed, \r\n). Two CRLF's mark the end of the header. The Gmail server will process our request, and send the feed as a response over the same HTTPS connection. This response is an XML document, that consists of tags with angled brackets, just like HTML. If you need a lot of data, it's recommended to use a proper XML parser library, but we only need one tag, so we can just skim through the response text until we find the <fullcount>x</fullcount> tag. The number inside this tag is the number of unread emails in the inbox. We can just convert it to an integer, and stop reading. The loop just prints the number of unread emails, and turns on an LED if you have unread messages. Many services send their data in JSON format. If you just need one piece of information, you may be able to use the same approach of scanning the entire JSON text for a certain word, but it's much easier to use a JSON parser, like the ArduinoJson library. It will deserialize the JSON text, and create a JSON object, you could compare it to an associative array. You can browse the entire tree structure, and easily find the data you're looking for. The downside is that it uses more memory.